Once upon a very terrible time, all five kids got a stomach bug at the same time… while I was gone… and my husband got it too. Thankfully we don’t get sick often, but it was terrible and I wasn’t on hand to use all of our natural remedies. That was the first and last stomach bug they’ve all gotten at once, but invariably, at least one child gets a stuffy nose or cough sometime during the winter. Or I dust our closet and give myself hay fever and get a cough/congestion/nasal drip for a few days. In those cases, I like to have this herbal throat spray on hand. It is great for sore throat, cough or congestion. All of these are optional and if you don’t have some of them on hand, you can make it with the others. You’ll make an herbal tincture with the herbs and then mix with raw honey for a strong spray. When made this way, this spray will last months in the refrigerator. To make the tincture, I combined 1 tablespoon each of these dried herbs: Echinacea, Ginger, Marshmallow Root, Elderberry, Thyme and Mint and 1 teaspoon of dried cayenne pepper (optional) in a pint-size mason jar. I poured 1/4 cup boiling water over the herbs to help draw out the beneficial properties and then filled the rest of the jar with a strong food-grade liquor like rum or vodka (must be at least 40% alcohol). Put on an airtight lid and let sit for at least two weeks or up to a year (the longer it sits the stronger it will be). Store in a cool dark place. I make this once a year and have enough to last at least the year. Here is my full tutorial on making herbal tinctures if you’re new to herbal remedies. Combine 1 teaspoon of all of the herbs you want to use in a small glass jar. Pour enough boiling water to just cover the herbs with water. Let steep for 20 minutes until water cools. Strain out herbs and mix with equal parts of high-alcohol liquor. I use rum or vodka. Use this mixture to make the spray as usual. If you don’t want to make your own, this pre-made one is similar and works pretty well, but I definitely prefer the taste and effectiveness of the homemade version. 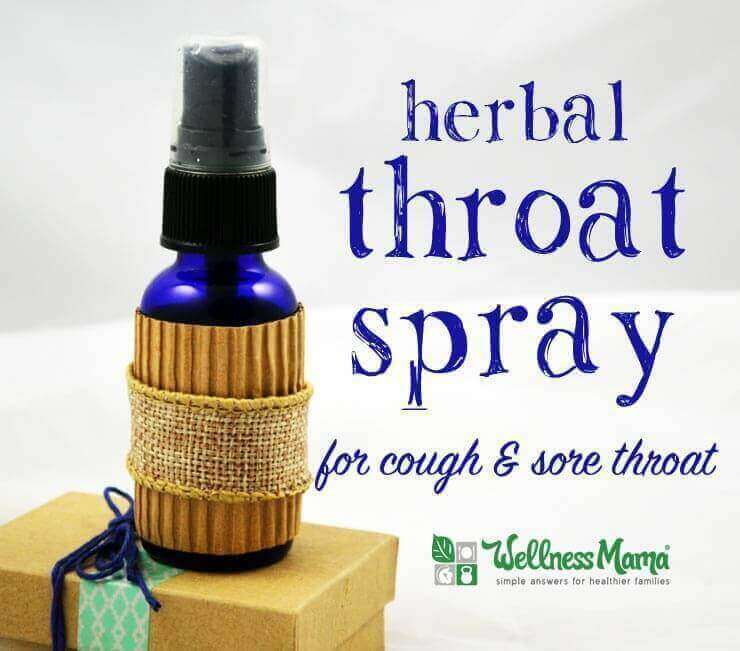 If you get a cough, sore throat or cold this winter, try this herbal throat spray to get some relief and feel better soon! ? Combine ingredients in a small spray bottle and shake until honey is well-mixed. Store in fridge for up to six months. Do you ever get a sore throat or cough? What remedies do you use?